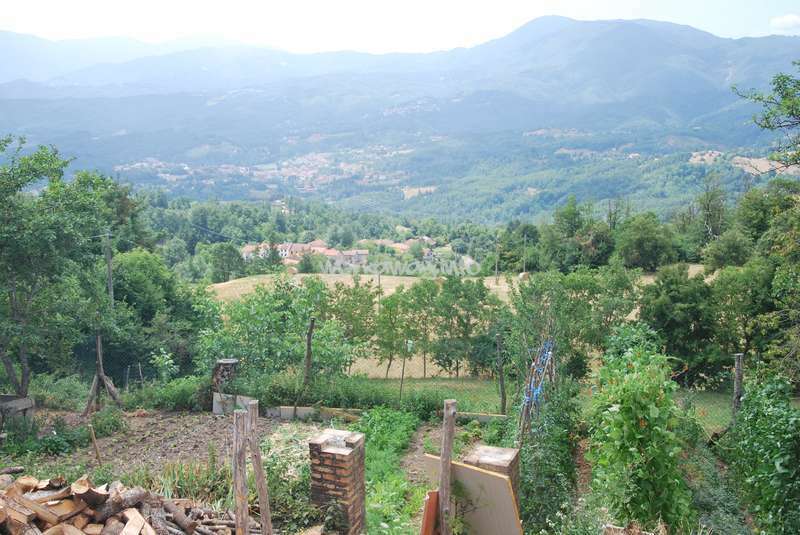 Help us on our organic farm in the appenine mountains near Parma, Italy. PLEASE READ BEFORE APPLYING!!!! : We can only house 1 person at once. No stays less than 1 month. We are now looking for people to help with the agricultural activities on the farm and light domestic work in the house (see below for more information) so please only message if you are interested in that line of work. Thank you! LEGGETE PRIMA DI MANDARE MESSAGGI: Possiamo ospitare due volontari per volta. Minima sosta 1 mese. Cerchiamo sopratutto persone disposte ad aiutarci nei lavori agricoli quindi scriveteci se avete passione per la vita agricola. Ci serve anche una mano ogni tanto a fare i lavori in casa. Grazie!!! 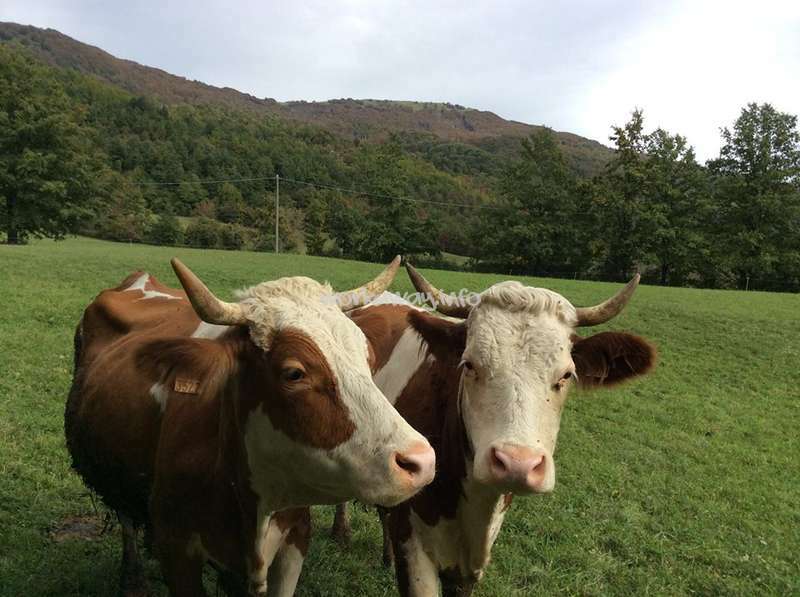 We are two young people (26 and 36 years old) and we have started a small-scale organic dairy farm in the Appenine mountains near Parma, Italy. 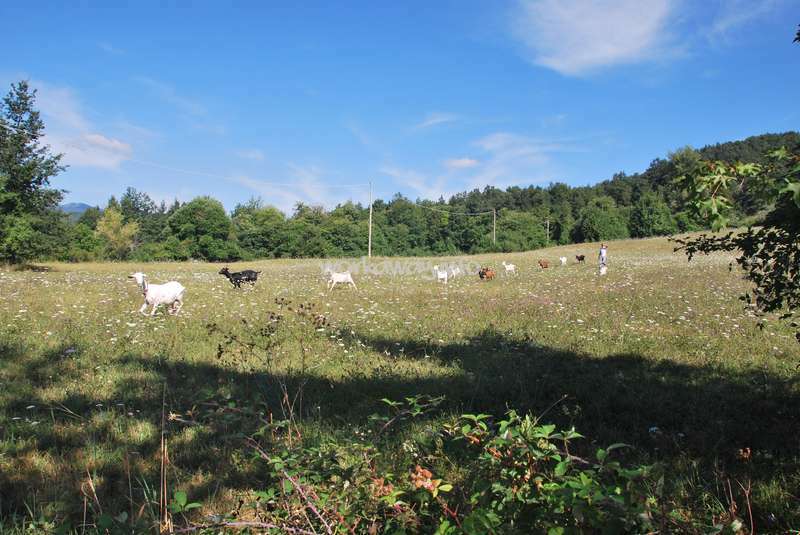 We have 5 cows and 20 goats, and we transform all the milk produced in our on-site dairy. We sell our cheese and yogurt at local markets. We also have a flock of 30 laying chickens. 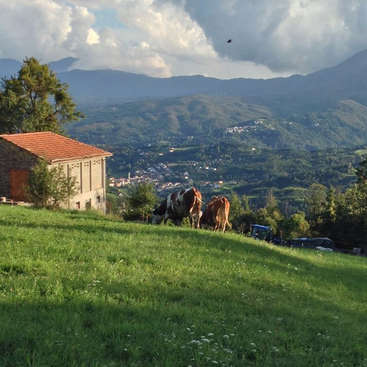 Our home is in the beautiful Val di Taro, at the foot of Monte Pelpi, and our farmhouse has a spectacular panoramic view across the whole valley. We are at 850 metres above sea level and about 5 km away from the nearest town, Bedonia. Our business of farming and cheese-making is very time-consuming, so we are looking for somebody who is willing to help out on the farm. Siamo una coppia di giovani (24 e 34 anni), abbiamo appena iniziato una nostra azienda agricola biologica sugli appennini parmensi. Abbiamo 3 vacche e 13 capre, trasformiamo il latte nel nostro caseificio e vendiamo lo yogurt e il formaggio nei mercati che ci sono nei paesi vicini. Abbiamo anche 30 galline da uova. Marco (34) è Italiano, Cassie (24) è Inglese. Il nostro lavoro ci porta via tantissimo tempo, quindi cerchiamo qualcuno che ci può dare una mano sopratutto nelle attività agricole. 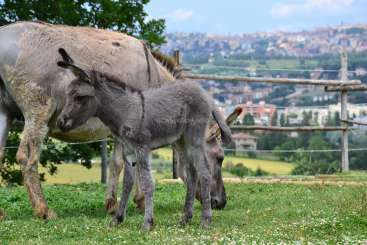 Agricultural tasks: Milking (goats by hand, cows by machine), helping in the dairy with cheese-making (not every day), feeding animals, hay-making, working in the vegetable garden, maintanence of woodland and fields. Private bedroom in our farmhouse, with the possibility of a private bathroom. Una camera privata nel nostro podere, con la possibilità di un bagno privato. 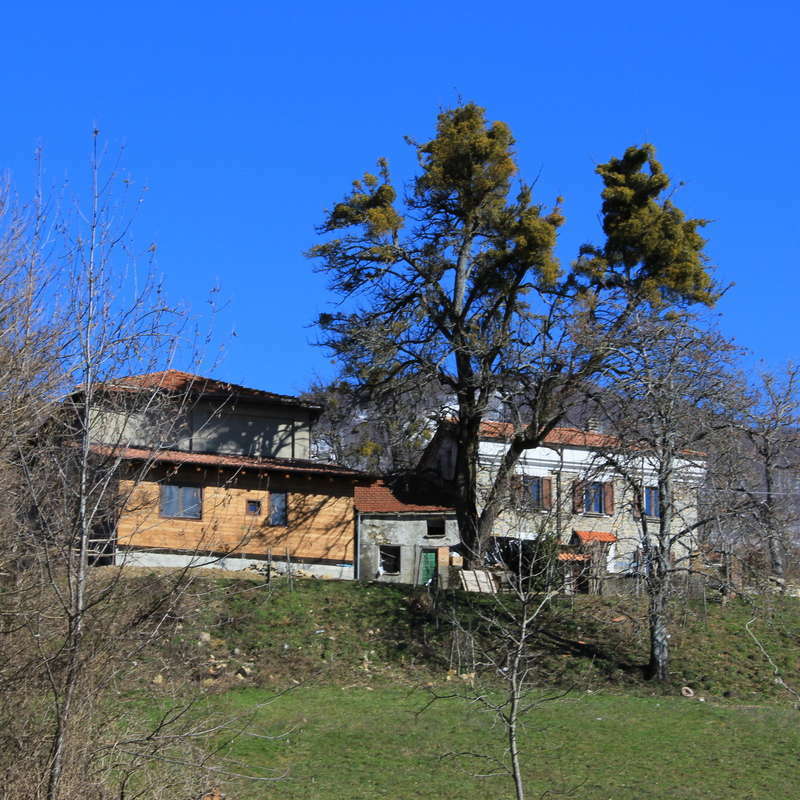 We are near the town of Bedonia, a short distance from Borgo val di Taro. We are conveniently located on the border between Emilia Romagna, Tuscany and Liguria. This means that popular tourist destinations such as La Spezia, Bologna, and all the main Tuscan cities are a short train journey away. We live in a very beautiful and tranquil valley, which is perfect for anyone who loves to live in a natural setting and enjoys mountain scenery. 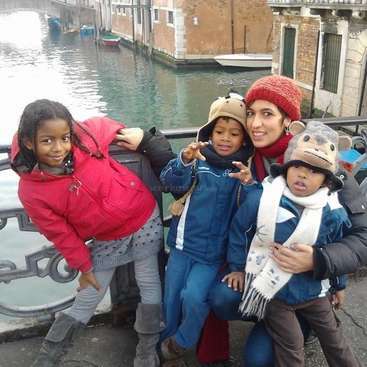 We are also near Chiavari, a popular seaside destination for tourists. We have had experience over the past 5 years hosting volunteers on the various farms we have worked at. We also have a least one volunteer living with us during the warmer months of the year. We try our best to make people who stay with us feel like part of the family, and the social and cultural aspect of volunteering is very important to us. For this reason we ask for people who are interested in integrating with our lifestyle and getting to know us. We are vegetarian but respect the right of volunteers to eat meat if they wish to. Our main necessity is in the various aspects of our agricultural work, including animal husbandry, cheesemaking, and the marketing of our products. We are both fluent in Italian and English and are happy to help in any way with can with people who want to learn either of these languages. We prefer people to stay for a minimum of 2 months. Please contact us if you have any other questions. 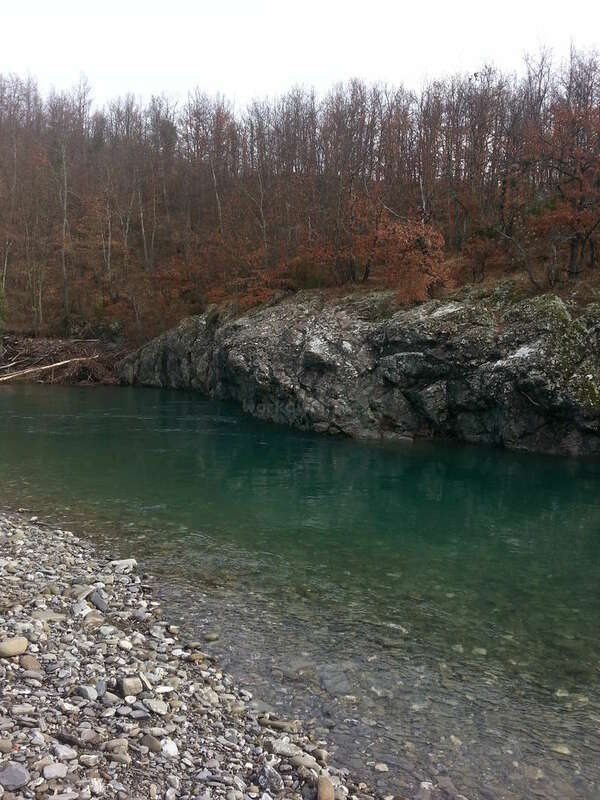 A nearby river where we go swimming in the summer. It is deep enough to dive off the rock you see in the photo! Lunch outside with the volunteers! I had an amazing time here, couldn't have been better for my first workaway experience. Cassie and Marco are both very nice and kind, I really felt like home for the one month I spent there. 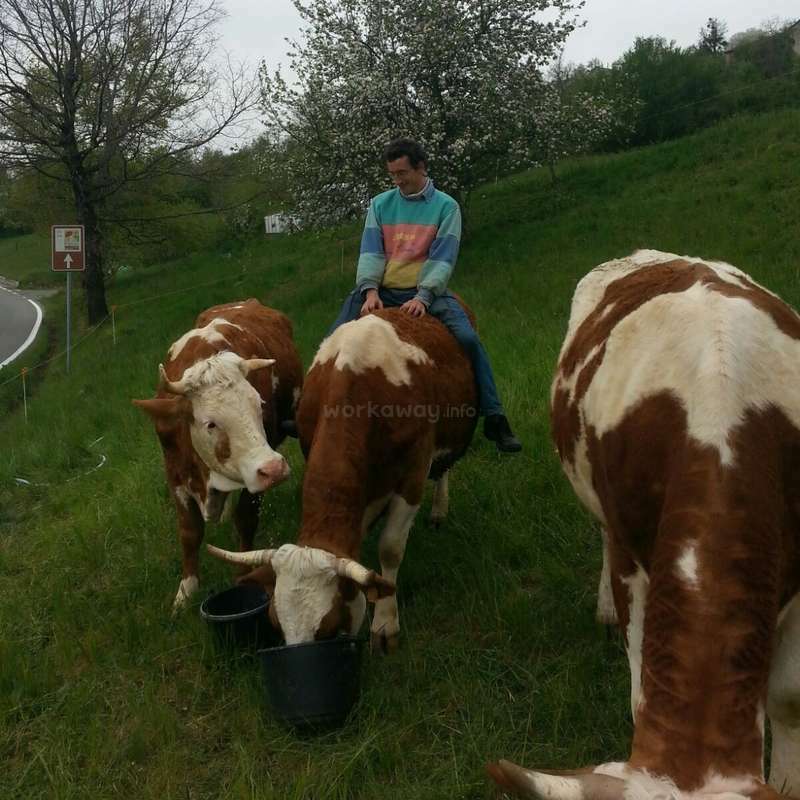 The work is great, I learned how to milk a goat by hand, the animals are really friendly as well! There's nothing like scratching a cow's neck while she rests… read more her head on your shoulder :) Cassie's cooking is absolutely fantastic! I've had so many lovely meals (dinners and teas?). And the Tiramisu Marco made was definitely the best I've had. I recommend coming here for everyone, it's going to be great! Almost two months I stayed with Cassie and Marco, and it was so wonderful. They are very kind people and great hosts. I enjoyed the animals, milking the goats with Marco, the pizzas in town, feeding the baby goats, eating Cassie's spectacular cooking, taking in the beautiful view (truly amazing!) and having interesting conversations... Do youself… read more a favor and stay here, if you want at really good workaway experience. The work is not too hard or too long and the accomodation is among the best I've lived in while volunteering. Oh, and the cheese is delicious! And did I mention Cassie's cooking? This was my first Workaway experience and it could not have been better! 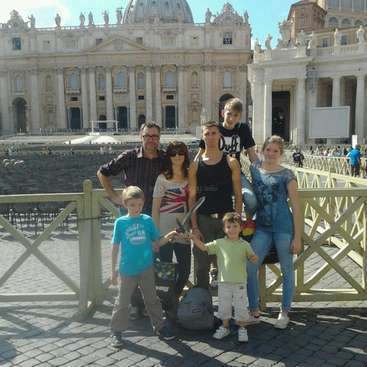 Cassie and Marco are such friendly, relaxed and warm people, I felt at home immediately. Marco is always making jokes and Cassie is an incredible cook. Even though I had to learn everything, they were always very patient and I never felt under pressure to work faster or… read more harder. The chores were quite easy and fun to do and I learnt so much about the farm, the animals and the country. I loved working with all the different animals. 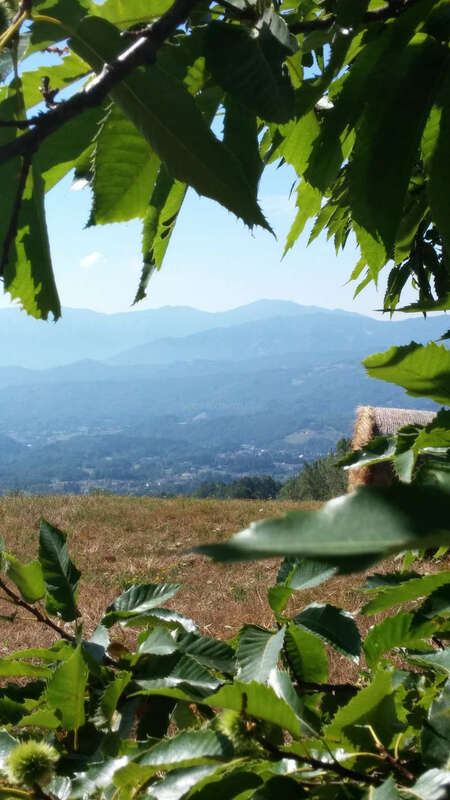 The view from the farm is incredible and there are lots of hiking paths around. Thank you so much again, Marco and Cassie! If only all workawayers were like Brianna! The month in which she stayed with us on the farm just flew by. It was so nice having such an enthusiastic, positive, optimistic presence in the house! Brianna took on every task with total committment and a sense of fun, never complaining about anything she was asked to do, and she completed all tasks… read more given to her with no problems at all. She is a very quick learner in all areas. She also went above and beyond what we normally ask of workawayers, contributing regularly to the cooking in the house (and above all producing the most delicious desserts and puddings for our enjoyment!!!) We were really sad when it was time to say goodbye. It was a pleasure to live and work with Brianna and we would reccomend her as a workawayer to any and all hosts! Cassie and Marco invited me into their home with such warmth and ease! I had such a lovely, happy, simple, and stress free (except when chasing cows hehe) time with them both. They have the most beautiful animals living with them (say hi to Smelly & Rambo for me!!) and such delicious fresh cheese (sorry for always eating all of it,… read more by the way ;)). Marco and Cassie were always ready to teach and answer my questions about farming which I appreciated so much! They have such an admirable lifestyle and I am so lucky to have experienced a piece of it with them. 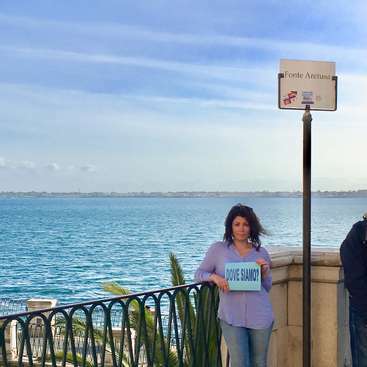 Grazie mille Cassie e Marco! Elena is the perfect volunteer! Hard-working, enthusiastic, with a permanent smile and lots of motivation... her month with us flew by, we wish she could have stayed longer, we miss her happy presence on the farm! She is very adaptable and does any job you ask her with lots of patience and no complaints. She is also very interested in farming and… read more has lots of enthusiasm for learning! Early mornings are no problem for her, she is the epitome of a 'morning person'! It was really great having her with us, we do hope that she will come back to visit us one day soon! In the mean time we wish her lots of good luck with her studies and hope she has many more positive adventures in farming! Thank you Elena! Great first experience there!! Marco and Cassie are a fabulous couple, they make you feel like in home. It was my first workaway adventure and I can't be more satisfied. The jobs weren't like ''jobs'', they were like a nice activity to do, useful and entertaining. All my stay there (one month) was totally charming and amazing, it was like living… read more with friends; sharing stories, anecdotes, cultures....Every day was different and special, totally nice. I really miss this place now that I have left it, but i'm sure i'll be back someday! What a magical time I had! Marco and Cassie graciously welcomed me onto the farm making it feel like a home away from home :) the work was so fun and ranged from milking goats to cleaning windows which made every day feel a little different. Cassie and Marco are such charming and kindhearted people it was a treat to spend time with them :) I wish… read more you the best of luck in your future farm adventures and hope to be back one day! Better late than never... Amanda is an excellent person to have around, helpful and willing to apply herself to any task, plus a very pleasant and easy person to live with! Every job we gave her was completed very well, she is a quick learner and very adaptable. Also a very good cook! We really enjoyed having her with us, good luck to you Amanda… read more for the future, and thanks again for all your help! A great workawayer! Helpful, willing, adaptable, gives her all to every task you put in front of her. Very helpful in the house with cooking and cleaning, as well as in outdoor tasks and with animals. We thoroughly recommend her!Thanks for all your help Katja! I recommend this place.. perfect for people who like working with animals and appreciate natural surrundings!